The parttern that has existed since mid-February of awful industrial data and poor consumer spending, but good comparisons for everything else, is firmly intact. There have been a ton of pictures and videos showing the recent flooding in Texas. But this picture stands out as the best. First, a bit of background. Stevie Ray Vaughn's first album was called Texas Flood. It also contained a slow blues called "Texas Flood." 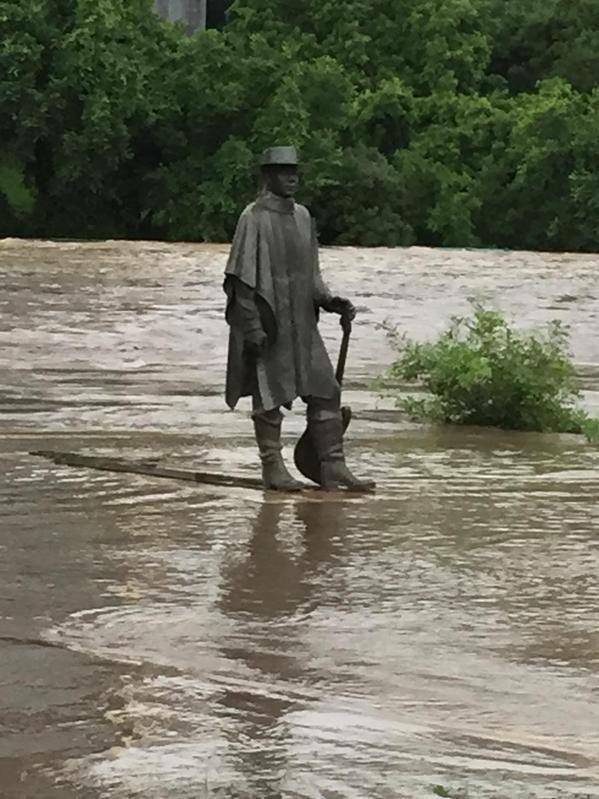 Here is a picture of Stevie's statue in Austin either walking on water or rising about the Texas flood. Either way, it's just perfect. Corporate profits and gross domestic income, two leading indicators from GDP, were reported for Q1 for the first time this morning. The news is mixed. At the moment the US economy doesn't seem to be flowing with any strong central current. I've been meaning to write an overview of these, and I suppose now is as good a time as any. No bunch of graphs or links here, just a sense of my overall view. 1. Without a big positive, the economy is being driven by smallball improvements. When all of these sources of increased available cash have dried up, recessions have ensued. In the case of refinancing, that has tended to peter out about 3 years after the last new low in interest rates. 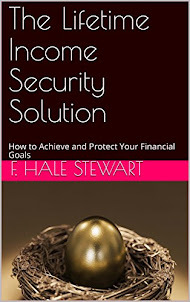 stock prices are at new all-time highs, fueling the wealth effect among the more affluent, while house prices have also appreciated to post-recession highs, meaning fewer homeowners are "underwater" although home equity withdrawal is probably dead for years to come. The earliest all three of these could be negative is the end of this year. Unless mortgage interest rates make new lows, beginning in 2016 the expansion is on borrowed time. As readers of this blog well know, the building of new housing affects the economy a year or more out. That's because houses must be filled with furniture, appliances, and other improvements. Decks, gardens, and other landscaping are installed. This can take several years. So in mid-2013, the "taper tantrum" caused a spike in interest rates. By early 2014, new housing completely stalled, in several months turning negative YoY. Since then mortgage rates fell by roughly 1%, and now housing has made new post-recession highs. This means that the poor GDP in the first quarter and probably somewhat now can be ascribed to the poor housing market of early 2014. Over the next year, the improvement in housing should feed through to an improvement in the broader economy. Yes, we have winter every year, but some are more severe than others. After 10 mild winters, in 2014 and 2015, the northeast and midwest had particularly nasty and cold winters. The data suffered. In particular, the awful winter probably accounts for the poor retail sales numbers in January and February (since recovered in March and April), and also the abysmal housing starts number in February (since completely recovered in April). This is outsourced to Bill McBride a/k/a Calulated Risk. Port traffic on the West Coast has returned to normal. This is best shown in the state by state breakdown in weekly initial jobless claims. New 15 year lows in nationwide claims have been set, even as states like - especially - Texas have had big YoY increases. Meanwhile the Empire State and Philly Fed indexes show expansion, even as Kansas City and Dallas show sharp contraction. At the same time, those Oil patch layoffs are probably responsible for the failure of retail sales to make new highs since November, as we know that those laid off cut back expnses sharply. At the same time, like in 1986 when oil prices collapsed, consumers at first saved the money, only spending it in full after the passage of an entire year. As I've pointed out in other posts, the US$ appreciated by about 16% on a trade-weighted basis between last summer and March. As a result, exports have taken a big hit, as shown in the weekly rail and steel statistics. At the moment, not only are Germany's beggar thy neighbor policies killing the Euro periphery, but that big slide of the Euro vs. the dollar has brought US growth to a complete standstill. That should remedy itself with a rebalancing of the currencies, but not with continuing brinksmanship in Europe over Grexit, and now Brexit and soon to be added Spexit. So far the US has, prudently, regarded this as "a fire across the river" to use the Japanese maxim. But with US growth so seriously affected, it migh be time for a more public and/or coercive approach. The Fed seems bound and determined to raise rates. In practice, it is treating 2% core inflation as a ceiling rather than a target, having tolerated lower inflation for years, but announcing that it will be proactive against any breach to the upside. When the Fed raises rates, what will happen to long rates? A significant increase will kill the housing market. A significant decrease will cause a yield curve inversion. The Fed has to hope that long rates remain in a narrow band of stability. I'm not holding my breath for the success of that strategy. There are some transient negatives (Oil patch wekaness, the overly strong US$), but at least until the end of this year, the economy is underpinned by fundamental positives. After that, there are lots of ways for the economy to enter a cul-de-sac, most notably interest rate increases and/or an increase in gas prices while I don't see the economy rolling over yet, I do think the expansion is past its midpoint, and is maturing. "The world will little note, nor long remember what we say here, but it can never forget what they did here."